On their third and latest record, Nearer My God, Foxing make an unapologetic decision to act on their arena-rock impulses, expanding on their inward emo roots with a highly ambitious panoramic vision that goes beyond any of the usual tropes in that genre. 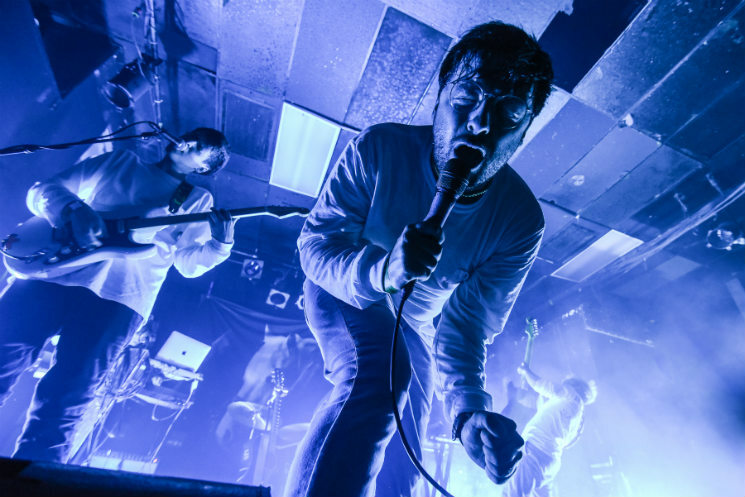 Foxing's depth of intensity shines in a live setting with this new outlook, and while Lee's Palace is hardly anything close to an arena, the St. Louis group owned the stage with their mutating rock performance. Dressed in matching white Foxing shirts with their names emblazoned on the back and bathed in a dreary green light, the six-piece entered the stage to Enya's "Only Time" before the synthetic beeping from Nearer My God album opener "Grand Paradise" began. Wandering around with his arms outstretched, lead singer Conor Murphy's falsetto twisted with suspicion to set a cinematically dark tone as he howled. As a frontman, Murphy has a pent-up energy that he slowly releases while he paces around the stage, suddenly bursting into a fidgety cry at certain points of songs while remaining elegantly reserved during the band's more dramatic moments. On prettier songs like "The Magdalene" and "Night Channels" from their second album Dealer, Foxing mellowed out, letting the twinkling symphonic reverb of Eric Hudson's and Ricky Sampson's guitars take over. Similarly, Murphy calmly took off his glasses to sing the sorrowful ballad "Three on a Match," a deep contrast to Foxing's frenetic new material. At the start of Nearer My God's "Lich Prince," Murphy's voice stretched deep with anxious tension as he searched for words to comprehend unrequited love. The inevitable crash of bursting guitars, along with Brett Torrence's crumbling bass line and Jon Hellwig's booming drums, drove the song into a downbeat fist-pumper as raiding guitars scrambled into an organize chaos. Later, drenched in a villainous red light, the band plunged directly into a hyperactive, jerky groove for "Gameshark," a song unrecognizable from anything Foxing have ever done before. Here, the hunched over Murphy turned hysterical, flitting between a high-pitched croon and a tortured shriek while Hudson raised his guitar skyward and Sampson lurched and jumped around with unbridled energy. Along with Sampson's thorny finger tapping riffs, keyboardist Carolyn Haynes triggered sampled bits of Murphy's pitch-shifted voice, which dotted "Slapstick," one of Foxing's catchiest songs to date. They ended the show with the orchestral, brooding fan-favourite "Rory" from their debut album The Albatross, which saw the audience singing along to the repeated line, "so why don't you love me back?" Towards the finale of the song, Murphy grabbed his trumpet to mime dejection one last time to close out the set, before the band abruptly (and hilariously) walked off to Cher's "Believe." Early in the set, before Foxing played Nearer My God's soaring title track, Murphy declared that their latest work is also what they were most proud of as a group. With their new album, Foxing have distanced themselves greatly from their past musical labels — they're still emo at their core, but between Murphy's R&B vocal cues, glitchy electronic sounds and Hudson's post-rock and ambient guitar inspirations, the band is fully embracing change and their newfound confidence shows in their performance.